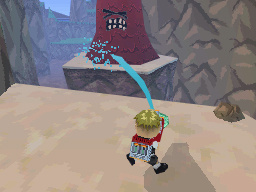 Renegade Kid's Maximilian and the Rise of the Mutant Mudds (known as MUDDS) was a DS project that failed to find favour with a publisher, but in this age of digital distribution that doesn't mean the project has to fall by the wayside. Jools Watsham of Renegade Kid has opened up the possibility of bringing Maximilian to DSiWare if the game's official blog receives 1,000 comments, with the current total standing at around 300. If you want to lend your support to the campaign, Jools Watsham's blog has all the details you need. No idea what MUDDS is? The video below reveals all. The concept reminds me of Super Mario Sunshine. For a second there, I thought this was about bringing M.U.D.s to the DS. *Just kiddin', looks kinda fun. Unlike renegade kid's current 3 ds games, this looks rubbish! It looks kinda cool but I'd really have to play it before I decide if it's worth releasing or not. Could they fit it into DSiware? hm. Water gun and water jetpack a la mario sunshine. We totally need this on dsiware. Really stop bickering if the game is good or not. Support independent game developers! This industry needs them! Did Renegade kid make MOON and the Dementium games? Either way this game looks awesome and I would gladly purchase it as long as it is more than just a water gun gimmick. In other words we need good levels, bosses, challenges, etc. But just based on the premise alone I am sold enough to add my name to the list! I figure it looks better than the majority of DSiWare offerings, so why the heck not? I wouldn't actually DOWNLOAD it without a good review as usual, but I see no reason to not give it a fair chance at release. That looks pretty awesome, too bad I don't have a DSi. Never heard of Renegade Kid. @shine Moon, Dementium ring any bells? That looks like a lot of fun, I always enjoy games that have a lot of character to them. Everybody should, even if you won't buy it. C'mon, do it. If only so I can get it and so DSiWare is expanded even if just a little. Actually, that game looks great! I filled out a comment on his site, but I didn't want to leave my real name along with my e-mail address available to others, and when I tried to log in through alternate means, my message got deleted. I have bought multiple copies of all three of their current titles that were out for myself and as gifts for others. I do buy games based on the fact they are associated with Renegade Kid because I associate them with quality work and I would definitely purchase MUDD day one if it were released on DSi just as I would purchase ATV Wild Ride in stores. I'll try again to leave a comment there later. Will he still make the game if all of the comments tell him not to do it? It doesn't look like any of the enemies fight back. Where's the challenge? I've already said yes. I really want to play this game. @pie4prez: Maybe you should watch the video provided if you think the enemies don't fight back. @sykotek At which point do they fight back? I don't see it. @Odnetnin: About 6 seconds into the video. Did it using my WordPress info. Hopefully this'll be fun! Meh. I'd much rather have it come to 3DS. I wanna support developers like Renegade Kid, even though I hated all their games (the touch screen for free look is an awful, awful idea. All FPS's on DS should've learned from Doom era shooters - or Metroid Prime's lock on -, but apparently hand cramps and spazzy stylus scribbling is cooler?). I just know I'd never play this as is on DSiware. Sorry guys. Jools Watsham video, shows a bit more gameplay. The concept seems cool, almost reminds me of Super Mario Sunshine and a bit of Banjo Kazooie. I left my comment, and its sad its only 349 at the moment, it looks like a fun game. |sf>I'd like to leave comments on the page, but I'm not sure how you use your pre-existing account to log in. The top of the blog mentions AIM as an option. I don't want to apply for a Google account, since I already have an AIM account. I also have a Lifestream connection to my AIM account and I noticed some people were logged in through openID. Could anyone please walk me through the way to use my AIM account to log in for comments, without having to apply for a new Google account? |sf>Never mind. I figured it out after I posted that. This game will never be realised.